The game is called Ant, and centers on the adventures of a red ant who went in search of the stolen larva. He will pass dozens of complex underground structures, where some insect larvae were abducted. 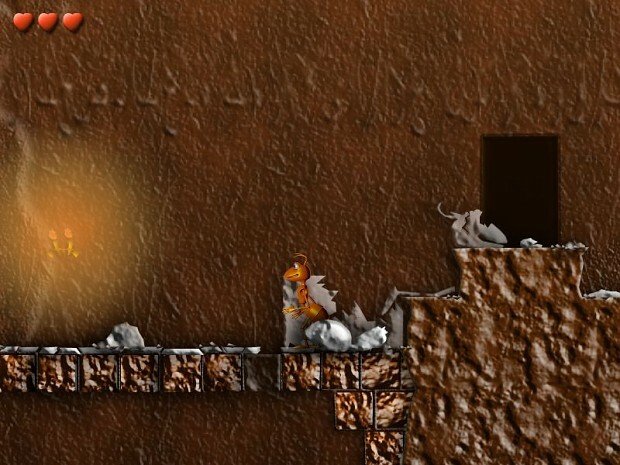 An important skill to ants is the ability to lift, carry and throw the bricks to make steps to advance to the platform level. The main task at each level is to get to the next pass, the door to the following level. But this will not be not so simple. Levels are made in organic style, as if made of clay and viewed only from the side. Levels are opened when cleared in sequence. The game does not require any special skills nor is it time consuming. Generally it Generally it takes about a half hour. It's very simple and clear. Ant Game by TOF Studio.